Order your all-in-one RCAA promotional/event kit, download extra RCAA materials and logos to use for your event, and locate media from the DCMP collection to use on March 3 and all year long! For this year’s RCAA events, we’ve put together a convenient kit that contains printed RCAA materials and—for registered DCMP members—a new RCAA DVD featuring 6 popular Dr. Seuss titles, including The Cat in the Hat, Green Eggs & Ham, The Lorax, and more! Simply fill out our online RCAA kit request form, and we’ll ship you a customized kit within a few days. As with all other DCMP services, there is no charge for the kit or for shipping (please note that the DVD must be returned to the DCMP in the enclosed pre-paid envelope, as with all of our media). If you order the kit with the DVD, be sure to fill out the DCMP username field on the request form so that we can verify your account. If you are not yet a DCMP member, now is the perfect time to register for a free account. In order to borrow media from our collection, you must be a teacher, parent, or other party involved with educating at least one K–12 student who is deaf, hard of hearing, blind, visually impaired, or deaf-blind. Teachers and ASL interpreters in training—along with teacher or interpreter training personnel—also qualify for lending privileges. This certificate is included in the RCAA Event Kit. Download and print this certificate of participation as a keepsake for students and others who participate in your RCAA event. Download and print this flyer to promote RCAA. An alternate flyer is also available with space reserved at the bottom to provide details about your event. This bookmark is included in the RCAA Event Kit. 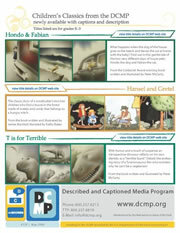 Download and print this bookmark as a reminder for your event participants that reading captions is just like reading books: both strengthen literacy skills and should be practiced every day! This poster is included in the RCAA Event Kit. 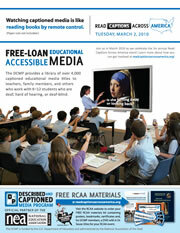 Download our large poster intended to promote RCAA. This poster is included in the RCAA Event Kit. 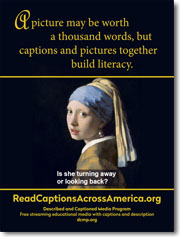 Download our large poster that uses the iconic “Girl With A Pearl Earring” painting to illustrate how the combination of pictures and relevant captions can benefit literacy. This poster is included in the RCAA Event Kit. 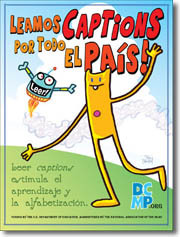 Download our large RCAA Spanish-language poster. The RCAA logo is available in several configurations and sizes. The files below are in PNG format and can be downloaded by right-clicking on the links below and choosing “Save As.” (Contact us if you require a different format, such as JPEG.) A PDF containing high-resolution, printable RCAA and DCMP logos in CMYK format is also available. Use the logo only to promote RCAA, which includes promoting your events and activities. Do not use the logo for any commercial purpose. Thus, you must avoid stores and other sponsors selling their products in conjunction with the logo. For instance, “Buy one, get one free” promotions in honor of the DCMP’s RCAA are not permissible. Use the logo only as it appears. The logo may not be modified in any way except that it may be reduced or enlarged in size to fit the space available. You may not separate the graphics from the rest of the logo. Do not use the logo with the logo of any business or sponsor. You are, however, encouraged to include the name of your local association and/or school along with the DCMP’s RCAA logo. 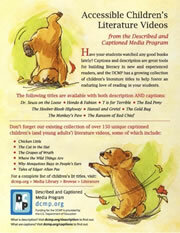 RCAA is a partnership project with the NEA’s Read Across America. We encourage you to read the NEA’s copyright and licensing arrangements regarding the use of content owned by Dr. Seuss Enterprises and also use these logos when appropriate in promoting your Read Across America events and activities. 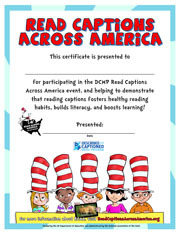 However, by no means must your RCAA event be limited to only Seuss titles. The DCMP collection contains hundreds of titles based on popular children’s books, many of which are probably available in your local school library! Explore our catalog today, or check out the flyers below for ideas about how to expand your RCAA event this year. 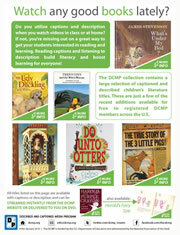 Click on the images below to download flyers with recommended children’s literature titles to enhance your RCAA event.